I am so glad I was able to catch the AI Live! Tour last Friday at the Smart-Araneta Coliseum. It was a really great way to end the work week! Incidentally, I had been in a sing-song mood the whole week and the only time I was able to let it all out was at the show. It was so fun!! All the Idol Top 10 finalists were really amazing! Rumor Has It by Elise Testone! She was a little bit scratchy on show night but she still managed to give a really great performance! Loved her whole set. Of course, there's Jessica Sanchez! Her whole set, too, was really amazing! Girl's truly in her own zone when she's performing and I love it! My favorite song she did was How Come You Don't Call Me, I was freaking out the whole time that my dad was the one getting embarrassed for my being so loud hahahaha! It's been exactly a week since I got to see the last Potted Potter show here in Manila and I still have these little flashbacks of the funny moments that stuck with me. Like, that Snitch joke about the little girl Seeker from the audience - "She's got 99 problems, but a Snitch ain't one!" Yes, we played live Quidditch at the show! It was hilarious! And that was just one of the things I loved about the whole production! Here's a 70-second preview of the 70-minute show for those of you who missed it or just want to reminisce, like me! 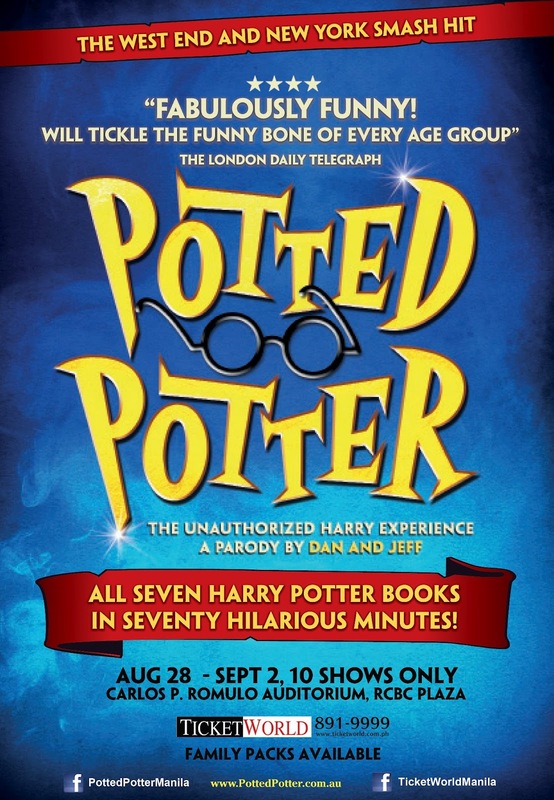 Dan Clarkson and Jeff Turner (seen in the video above) who were the creators of Potted Potter sadly weren't able to do the show personally here in Manila (they ended up being double-booked, with other shows going on in New York during the same dates) but they sent the two best acts they could find to play themselves, and as you can assume from my previous exclamations, watching Jesse and Gary play the parts was still very much worth it albeit them being only alternates. For us Potter fans, I guess we're lucky that the love for one boy wizard is universal because we still get to enjoy lots of different Potter-related entertainment even though the books and the movie franchise have come to an end. Finally, I just want to include this quote from Jo Rowling - I believe it to be true as long as Harry and the rest of the characters stay in our hearts: "No story lives unless someone wants to listen. The stories we love best do live in us forever, so whether you come back by page or by the big screen [or by other means, I guess], Hogwarts will always be there to welcome you home."